1st King's Dragoon Guards charging at Waterloo. 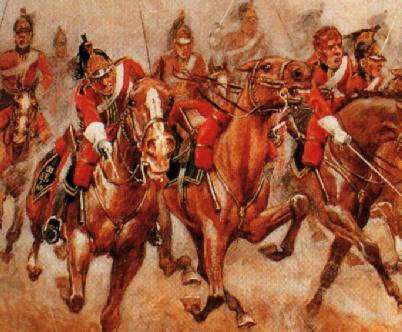 There was essentially no difference between the British Dragoon Guards and Dragoons. The designation "Dragoon Guards" did not reflect any difference in role between the two cavalry arms. However, the Dragoon Guards may have had a sense of being an elite corps - thus fostering a greater sense of courage and devotion to duty. There were 7 Regiments of Dragoon Guards. The 1st saw action only at Waterloo, while the 3rd, 4th and 5th only saw action in the Peninsula. Uniforms of the Dragoon Guards were virtually identical to those of the Dragoons, i.e. - Red jacket with facings on collar and cuffs - yellow or white lace on jacket front, collar and cuffs. - White breeches with high black boots - or grey overalls. 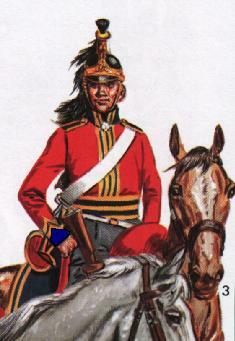 (Above) Dragoon Guard officer in pre-1812 uniform. 1st King's Dragoon Guards trooper in post-1812 uniform. Reproduced with kind permission of Liliane and Fred Funcken - Historische Uniformen.